(15/P107) TRENTON – The Christie Administration is implementing changes to the state’s shellfish-safety program to ensure that New Jersey meets the highest harvest-to-market public-health protection standards and promotes future growth of shellfish aquaculture, Department of Environmental Protection Commissioner Bob Martin announced today. The DEP today proposed changes to its Shellfish Growing Water Classification Rule, which establishes standards for protection of water quality and harvesting of hard clams, surf clams, ocean quahogs, oysters, sea scallops, bay scallops and blue mussels. The proposed changes are published in today’s edition of the New Jersey Register. Commissioner Martin also signed an Administrative Order that will assist in the implementation of the objectives of the proposed rules by requiring registration of aquaculture operations, launching harvester training, and requiring compliance with the U.S. Food and Drug Administration’s National Shellfish Sanitation Program standards. The changes ensure dealers in the state will remain on the FDA’s Interstate Certified Shippers list. The DEP and New Jersey Department of Health have worked cooperatively with the FDA for many years to ensure the safety of shellfish. Reinforcing implementation of best practices to ensure shellfish is harvested from appropriate waters and that steps are taken to get it to market as quickly as possible, an effort that is being complemented by an online training and certification program. Updating classification of waters used to harvest shellfish. Consolidating and providing greater consistency for permitting of various commercial shellfish activities. Establishing permits for aquaculture activities. Implementing a management plan to reduce risk from Vibrio parahaemolyticus – a pathogen that is present naturally in water regardless of water quality. 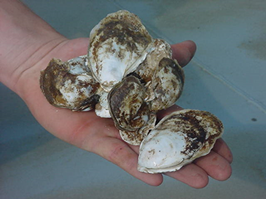 The plan stresses protecting oysters from excessive heat and getting them to market as quickly as possible during the summer when hot weather can cause bacteria to multiply to unhealthy levels after oysters have been harvested. Hard clams, surf clams, ocean quahogs, oysters, sea scallops, bay scallops and blue mussels are filter feeders, meaning they take in particles of food that pass through the water. Consumers can become sick from eating raw or undercooked bivalves that have taken in elevated levels of bacteria or viruses due to poor water quality. Cooking typically kills these pathogens, but many people enjoy shellfish uncooked. Over the years, New Jersey has been recognized as a national leader in restoring the viability of commercial shellfish beds through strong regulations protecting water quality. The DEP monitors, classifies and enforces shellfish regulations in 425,830 acres of estuarine beds and 295,857 acres of ocean beds. The DEP gathers and analyzes more than 12,000 water samples from these waters each year. At any given time, 75 percent or more of the state’s classified waters are rated as approved for shellfish harvesting.